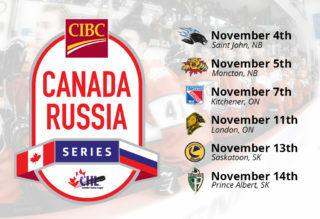 2018 marks the 16th CIBC Canada Russia Series, an annual event that dates back to 2003 when current day NHL talent in Corey Perry (London Knights) and Jeff Carter (Soo Greyhounds) competed. The CHL holds an all-time record of 63-23-1-6 in the event, while Russia won its 30th game in event history in Game 2 in Vancouver. The OHL holds an all-time record of 25-5-1-0 in the CIBC Canada Russia Series. In the 10 instances that the OHL has defeated Russia in their first encounter, the OHL has gone on to win the second matchup every time. The CIBC Canada Russia Series returns to Oshawa for a third time following past games in 2006 and 2013. In 2006, Bryan Little (Barrie Colts) scored the game winner in a 4-3 Team OHL victory. In 2013, Nikita Zadorov (London Knights) picked up three assists in a 5-2 Russian win. TWELVE NEW FACES IN OHL LINEUP: They might not be what you’d call fresh legs following a weekend of OHL action, but 12 new players will join the Team OHL lineup tonight in Oshawa including goaltenders Hunter Jones (Peterborough), Jordan Kooy (London), defencemen Declan Chisholm (Peterborough), Thomas Harley (Mississauga) and Kevin Bahl (Ottawa) as well as forwards Serron Noel (Oshawa), Jack Studnicka (Oshawa), Austen Keating (Ottawa), Alex Formenton (London), Nate Schnarr (Guelph), Ty Dellandrea (Flint) and Ryan Suzuki (Barrie). KOOY REPLACES VILLALTA ON OHL ROSTER: Los Angeles Kings prospect Matthew Villalta (Sault Ste. Marie) suffered a lower body injury last weekend and will be sidelined for a few weeks. Replacing him, Vegas Golden Knights prospect Jordan Kooy (London) currently leads the OHL with a 2.11 goals-against average and a .930 save percentage. DELLANDREA, MERKLEY, KEATING ALL TRENDING: Team OHL features a trio of players entering action on point streaks. Ty Dellandrea (Flint) has helped the Firebirds win their first two games of the season in the past week, registering points in 10 straight games. Ottawa 67’s forward Austen Keating enters on a nine-game streak while Guelph defenceman Ryan Merkley also has points in nine straight contests.